StudioPress is known as one of the best sources to buy premium WordPress themes. Genesis child themes only work with Genesis Framework. It means you need to install both Genesis theme and framework on your wordpress site. You can’t take benefits by just installing Studiopress premium Genesis child themes, it will not work without it. You may know Genesis is the top notch framework and highly recommended by wordpress theme developers and experts for building any type of website. Frameworks are easy to use, so developers can do anything they want to do when customizing or building Genesis child themes. Studiopress Genesis framework makes any wordpress site just excellent, clean coded, flexible, fast loading and SEO friendly. It’s the top choice of wordpress users, themes developers and also bloggers. As I say, Studiopress child themes are SEO (Search engine optimization) friendly that helps you to get high ranking in SERP’s. Here are some of the top Child Themes of Genesis, which can help you create an impressive site for any niche. From the below list of wordpress themes you can choose any one that suits your blog niche and topics. Every layout has crafted with clean codes, SEO friendly guidelines, Unique chemistry, and beauty. The prices of all layouts included with Framework. However, if you just want to purchase genesis framework, it worths $59.95. 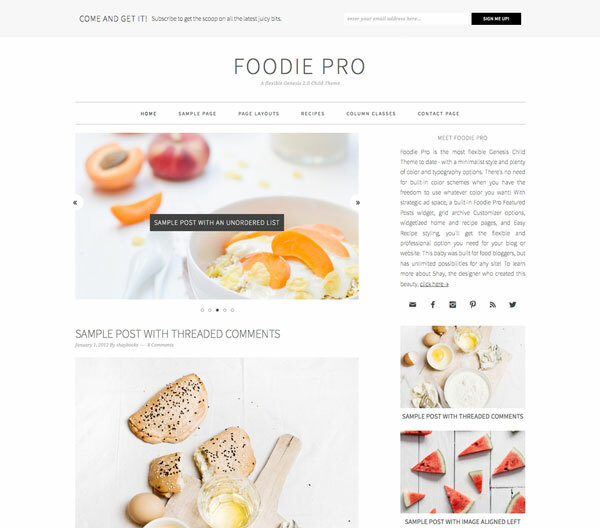 Foodie is a minimalist wordpress theme which comes with clean design, six different layouts, featured images, themes customization option, custom header, mobile responsive and HTML5 markup supportive. You can use this theme with your unlimited websites just by paying single time. However, you can access to detailed tutorials, support, and updates provided by developers. 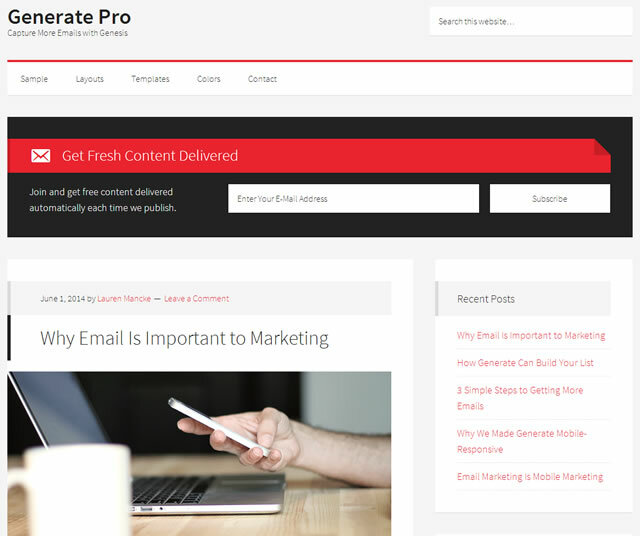 Generate Pro is featured wordpress theme as studiopress described. The parallax effects will grab your eye attention, and its features and flexibility will force your mind to buy this one. This layout comes with four different color schemes, three designs, HTML5 markup, Landing pages, Theme options, Mobile responsive, custom header and Theme customization functionality. This layout is especially best for those who wants to boost and collect emails of their visitors. As you can see email list collecting widget is placed above the fold to increase maximum impressions and users attention. This genesis wordpress theme by Studiopress allows your visitors to read your blog contents like an interesting story, with no pause, break and lead them a right call to action. 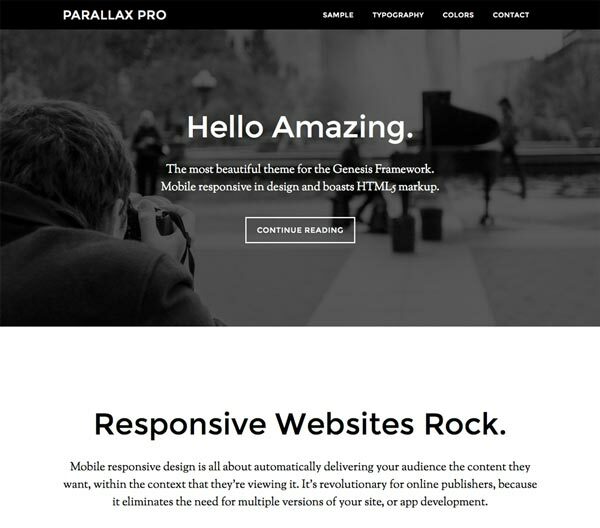 Parallax theme divides your content into parts with a clean connection between them. It comes with following features; HTML5 markup, five color styles, Mobile responsive, Custom header, Themes options and Footer widgets. You can customize this wordpress theme without facing any problem. Wants to share your objectives and plans to your valuable client with authority? Then Executive Pro is just right for you and your business. 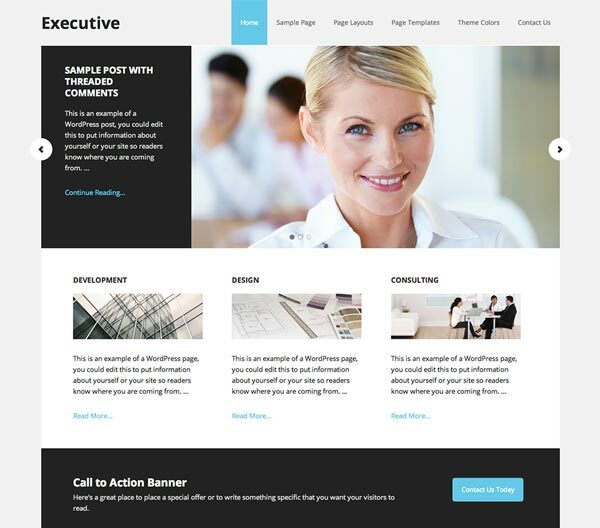 Executive genesis child theme designed with the understanding that your most important projects need to be front and center strategically and expertly displayed. This theme has three layout options, seven colors style, HTML5 markup, Custom header, Mobile responsive, Fixed width, Features images and Many more features. Share and publish your articles with this clean, bright and magazine styled wordpress theme. This layout is flexible and mobile responsive to make any site Google’s mobile-friendly guidelines. Lifestyle’s smart design and clean look let you express yourself with articles, videos and everything in between while valuing your strong point of view. 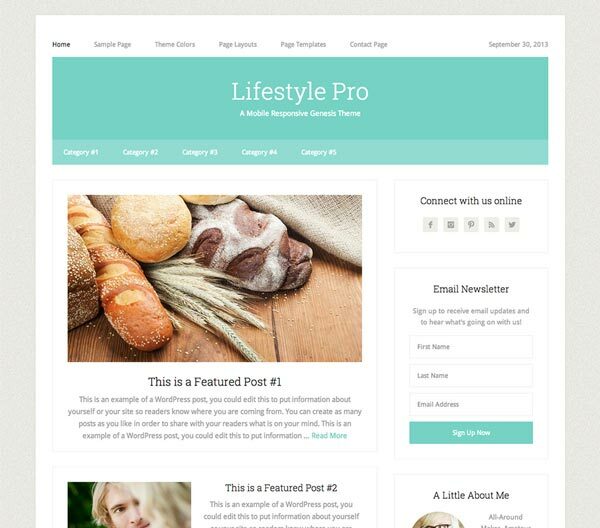 Lifestyle wordpress theme comes with 6 Colors & Layouts, Custom backgrounds and header, Featured images, Footer widgets and Threaded comments feature. Third party developers create this genesis child theme. The bold, sleek styling and colorful, contemporary design of the Modern Blogger theme make remarkable blogging in a crowded world a snap. You can get following features with this wp layout; Custom backgrounds and header, Featured images, Fixed width, HTML5 markup, six layout options and Threaded style comments. 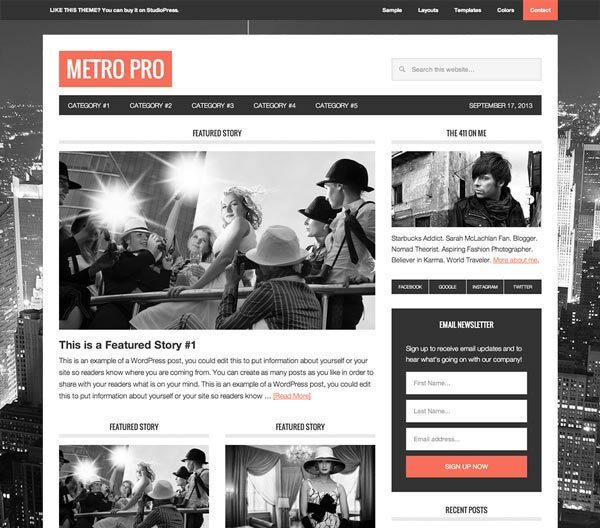 Metro Pro, a magazine style theme build for an optimized mobile responsive platform. 1152 pixel wide frame help you to highlight your publishing on a wide screen displays. The sleek social features will help you build the audience faster than ever. Here are some key features of this beautiful layout; 5 Color styles, 6 Layout options, Custom header and background, Custom menus, Landing page template, HTML5 markup, Mobile responsive and Theme customization options. 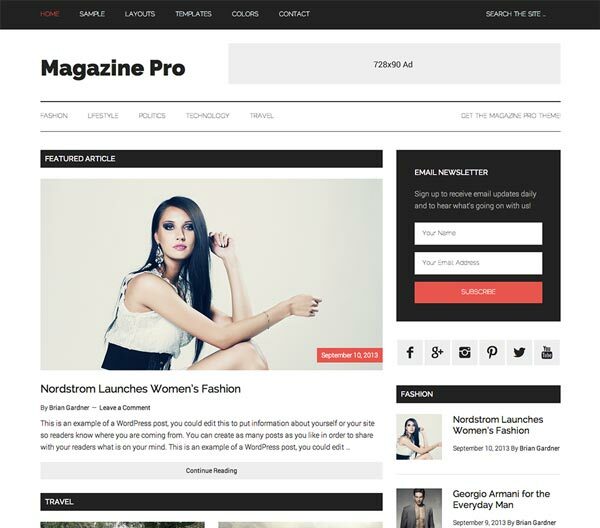 Magazine Pro is charming, magazine-style, ads ready and high beautiful looking theme for wordpress blogs. 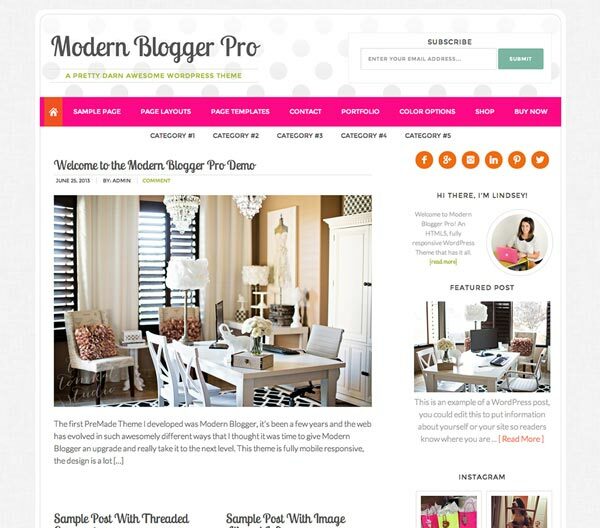 This theme is perfect for blogging and personal websites. Your online features never seem better than with the versatile layouts and media-ready design of the Magazine theme. A stylish frame speaks volumes about the publisher. Characteristics of this design are; Fixed width, Mobile responsive, Theme options, HTML5 markup, Custom header and menus, 4 Color styles, 6 Layout options and much more. Swank is a clean, airy and portfolio design theme that keeps your content focus while framing it in style. 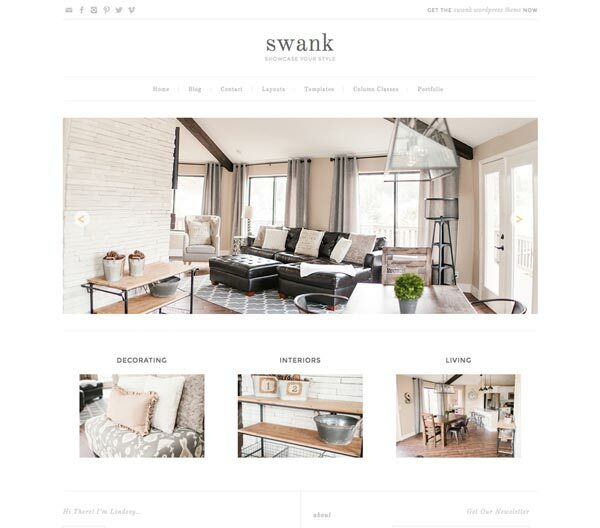 Swank is just as functional as it is gorgeous and best wordpress theme for portfolio, gallery and images niche websites. The number of features such as 6 Layouts, Custom Header and background, Featured images, HTML5 markup and Mobile responsive feature makes it just awesome. When you have readers and customers who are always hungry for more content, deliver it in style with the publishing powerhouse “NewsPro Genesis Child Theme”. It supports all of the great articles, audio, and videos of the heavy content site, with eye-popping design and simple navigation. 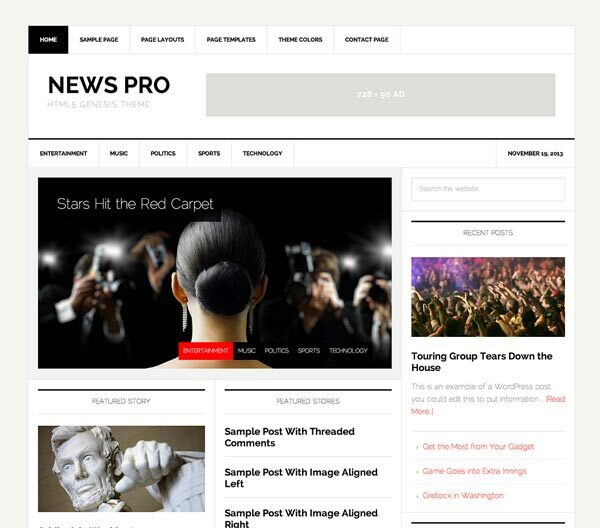 News Pro theme keeps you on the front lines. Features of this layout are’s; Fixed width, Mobile responsive, Theme options, HTML5 markup, Custom header, background and menus, 4 Color styles, Featured images and 6 Layout options. All layouts are premium and having great design, layouts, and color schemes to make your site more user friendly. You can get more information by visiting provided links for each template. I hope you will like this collection of best premium Genesis child themes for WordPress. Do let me know which one you have picked for your website and all other layouts you also like to buy for your next site?